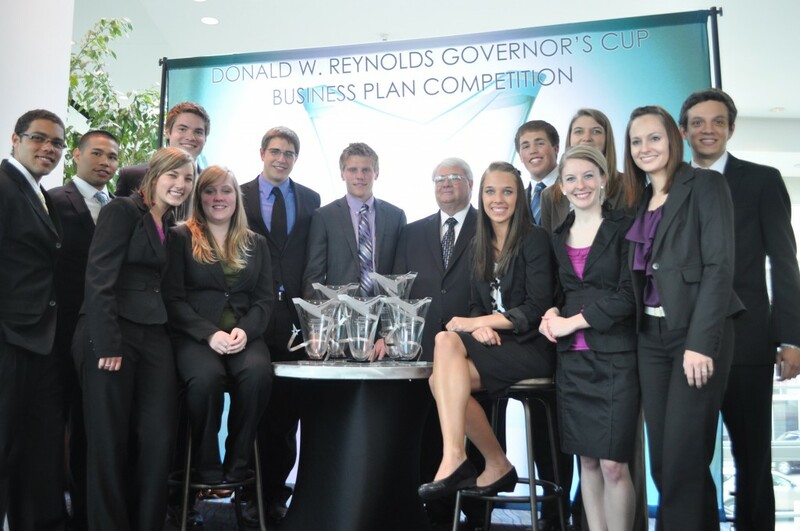 John Brown University teams took first and second in the undergraduate division of the Donald W. Reynolds Governor’s Cup business plans competition during a ceremony held in Little Rock on Wednesday. The JBU business plans outlined enterprises in paint sample innovation and livestock hydration systems. In addition, JBU teams won the Innovation Award in the graduate division and the Agricultural Award and the Elevator Pitch Award in the undergraduate division. JBU teams were awarded a total of $52,000 in cash prizes. The University of Central Arkansas and Harding University were the other schools represented in the undergraduate top six. University of Arkansas, Arkansas State University and University of Arkansas-Little Rock rounded out the top six team in the graduate division. Undergraduate first place: Simpler Solutions– Brandon Knight, Shantelle Overby and Jamison Hofer. Undergraduate second place, Agriculture Award and Elevator Speech Award: Hydrovate– Tina Funk, Josh Garrett, Amanda Abramovitz and Rolando Ochoa. Graduate Innovation Award: Innovative Athletic Solutions – Brittany Hopper, Matt Brooker, David Castagne and Abel Galliguez. Innovative Athletic Solutions’ first product MudOFF is a pregame formula applied to the sole of outdoor athletic cleats which reduces mud buildup. The only product made for this purpose, MudOFF helps performance in muddy conditions and makes cleaning easier by creating a barrier which inhibits mud clinging to the cleat. Simpler Solutions and Hydrovate will travel to Las Vegas in May to compete in the Tri-State competition. Pictured: front row, left to right: Tina Funk, Hydrovate; Shantelle Overby, Simpler Solutions; Jamison Hofer, Simpler Solutions; Matt Brooker, Innovative Athletic Solutions; C. Sam Walls, CEO of the Arkansas Capital Corporation, Brittany Hopper, Innovative Athletic Solutions; Ashleigh Dean, business programs graduate assistant and Amanda Abramovitz, Hydrovate. Second row, left to right: David Castagne, Innovative Athletic Solutions;Abel Galliguez, Innovative Athletic Solutions; Josh Garrett, Hydrovate; Brandon Knight, Simpler Solutions; Eva Fast, JBU instructor of business and team advisor and Rolando Ochoa, Hydrovate.